Whether or not a family member requires 24-hour home care, or live-in care, your elderly family member requires help, and has needs that the rest of the family probably does not. Providing compassionate, specially tailored care for your elderly loved one provides peace of mind for both you and your loved one. 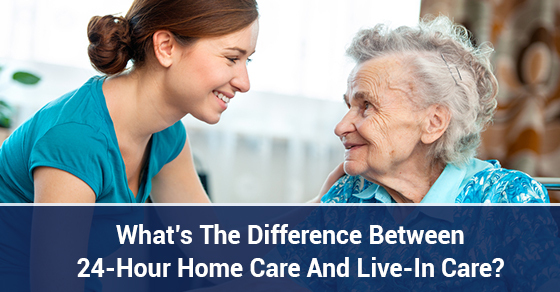 If you are debating how to best provide care for an elderly family member, and you want it to be done in the house, below are some of the differences between 24-hour home care and live-in care. With live-in care, there is typically only one caregiver who will be living with your elderly family member. They will be living in the same home as your family member and will be on call for them 24 hours a day. This includes a reasonable eight-hour sleeping break. Live-in caregivers typically charge a flat rate per day and have four-hour break coverage. Twenty-four-hour home care is slightly different. Twenty-four-hour care requires a minimum of two caregivers. Each of the caregivers (depending on how many are employed) will take turns providing care for their elderly client, in shifts of eight to twelve hours depending on how many people there are. Sleeping breaks can be negotiated, depending on the care requirements and the complications associated with providing them. They usually are paid by the hour. One of the main differences to keep in mind when considering the pros and cons of 24-hour home care is the number of people. With a minimum of two caregivers, this means that there are going to be more people coming and going from your loved one’s home. They will be interacting with more than one person, which can be a social benefit, or can irritate them, depending on their personalities and their needs. Often times seniors are reluctant to entrust their care to more than one person. They like to build a relationship with a single caregiver, and it can often take awhile to establish a strong bond and trust (the kind that is necessary for high quality care). With live-in care, however, there is no downtime in between shift changes. You can be sure that you always have a dedicated person in your elderly loved one’s home, on call for whatever need arises. This person will be sleeping in a room very close to your loved one, so assistance is never far away. That added peace of mind, however, does come with a flat rate fee that could be more, or less, than the hourly that a 24-hour home care provider would charge. You might have days where there is not much to be done and your elderly family member is asleep for much of the day. Whether 24-hour home care, or live-in care, having someone on hand to look after your elderly family member’s needs is incredibly important. You have your only life and you family to look after. And, while you will probably be spending a lot of time helping manage your elderly family member’s affairs, knowing that they are well looked after, around the clock, by a trusted professional will help you go about your daily life.